A Restaurant at a Legendary Location Deserves a Legendary Menu! If you’re coming up for a game and looking for a restaurant near the stadium, look no further! Sometimes it’s the view that makes all the difference for a local restaurant and it would be a challenge to find a better view than what you’ll find at D2 Sports Pub! While enjoying your first drink at the restaurant and considering pizza or burgers or sandwiches, glance up from our legendary menu and you’ll see something equally as impressive, Lambeau field! You won’t find a restaurant near the stadium as fan-centric as D2 Sports Pub! …or for a local restaurant favorite like Chicken Booyah soup, we’ve got it! We also have a great selection of fish for our Friday Fish Fry. It doesn’t get much more Wisconsin than that! Be sure to try some of our “D2 Favorites”, like the Chili Cheese Fries, Taco Pizza, Chef Salad, Philly Cheese Steak, or the Clubhouse sandwich. We’ve got the apps to get you started and the entrees to fill you up and keep you going! Whether you’re stopping in for a quick bite with friends, or out for a nice dinner with the family, you’ve come to the right restaurant! Sauces: Bleu Cheese, Ranch, Honey Mustard, BBQ, Mayo, Sour Cream, Salsa, White Queso, Marinara, Cajun Aioli, Creamy Horseradish or Tartar. 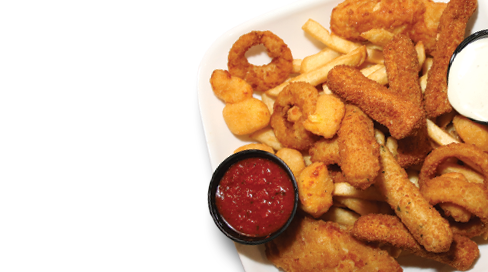 An assortment of our favorites: chicken tenders, cheese curds, onion rings, mac and cheese bites, tater teasers all served atop a bed of fries. Served with ranch and marinara sauces. Homemade tortilla chips or crispy tater tots. Piled high w/ taco meat, white queso, lettuce, tomato, onion, black olives, jalapeños, & sour cream. Served with salsa. A heaping helping of lightly seasoned fries. Shaken in your choice of Wimpy, Hot, Volcano, Spicy BBQ, Thai Chili, Parmasean, Garlic, or the sauce of the month. Celery & choice of dipping sauce included. Mounds of homemade tortilla chips, smothered with white queso sauce. Crispy, golden-fried chicken strips with french fries & choice of dipping sauce. tortilla. Served with lettuce, tomatoes, cheese, sour cream, & salsa. Breaded Wisconsin cheddar cheese fried to perfection & served with french fries. Beer battered onion rings fried to perfection. Creamy spinach, artichoke hearts and parmesan cheese. Golden fries topped with D2’s spicy chili & nacho cheese sauce. A sweet & sour twist on shrimp with a kick. Served with french fries. All dips are served with homemade tortilla chips. A mixture of diced chicken, D2s own hot sauce, Ranch, bleu and cream cheeses. A mix of zesty chili and white queso. Fried potato bullets with the right amount of spice served with french fries. Maplewood Meats famous andouille sausage served with siracha ketchup. Mound of perfectly seasoned fried chips served with a sweet onion Guiness dip. Jumbo lump crab cakes topped with mango salsa served with a cajun aioli sauce. 3 Mouth watering mini burgers, grilled to perfection. Served w/ lettuce, tomato, and onion. © 2019 D2 Sports Bar & Grill.